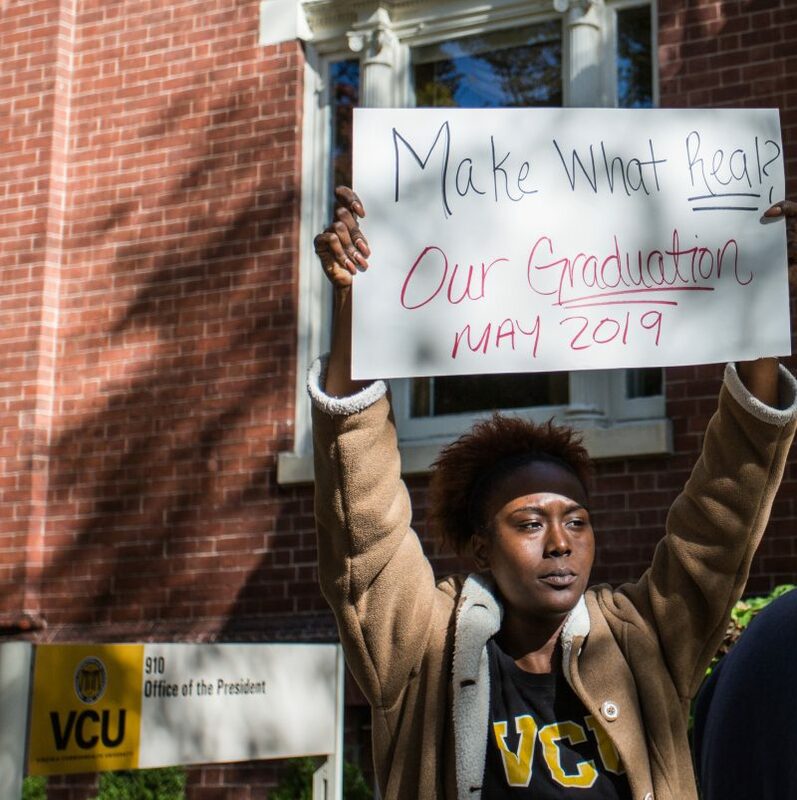 VCU will hold a university-wide May 2019 commencement, though details on the location have not been announced, according to the VCU Office of the President. This update comes one week after the university announced a cancellation of the event — which drew the ire of a number of seniors planning to graduate in the spring — due to the planned closure of the Richmond Coliseum after December 2018. Students held a small protest in front of the President’s Hall Oct. 31, a day after the initial cancellation announcement. Tanyqua Williams, a senior in the School of Social Work, said she attended the protest because of the “hard work, dedication, time and money” put into students’ majors. “At the end of the day, everybody’s story is different. And the only thing that could have gotten somebody to this point is the excitement for our graduation day,” Williams said. Attendees of the protest debated with vice president of university relations Pamela Lepley — whose office is in charge of planning commencements — in front of the president’s building during the protest. She attributed the initial cancellation to a “wide range of issues all put together,” including cost and accessibility. “We just didn’t have a place where we could have a ceremony to the standards a commencement should be,” Lepley said. Lepley said Monday she understood “how disappointing it was” to hear the spring commencement ceremony had been cancelled, but hopes students are happy the event is back on. 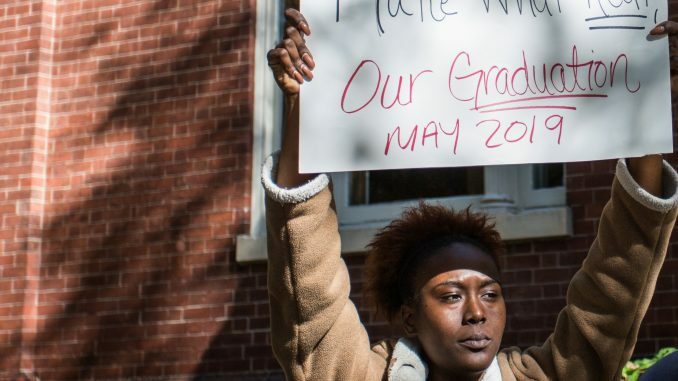 Evandra Catherine, a doctoral student in the School of Education, said although she was disappointed with the university’s initial decision, the disapproval expressed during the protest was aimed at the wrong people. VCU has held its spring commencement ceremony at the Richmond Coliseum since 1972, making May 2019 the first time since then the location will not host the event. Kaylin Cecchini, a VCU junior who created the Facebook event for the Oct. 31 protest, said she is happy seniors will get to have a commencement ceremony in the spring “regardless of what motivated them” to hold the event in May. Richmond Mayor Levar Stoney announced Nov. 1 that proposals for redeveloping the Richmond Coliseum area will be brought before the city council. Plans for the downtown area include a new arena, a hotel, a large apartment building, low-income housing, a new GRTC transfer station and space for stores and restaurants. Lepley said the office of university affairs hopes the new arena will be ready to hold VCU’s spring commencement ceremonies as soon as possible, but until it is complete, a new location will have to be used for the event. “In the meantime, we’ll continue to find a place for our central ceremony until that building is complete,” Lepley said. Evandra Catherine, previously mentioned as a senior in the School of Education, is actually a doctoral student.